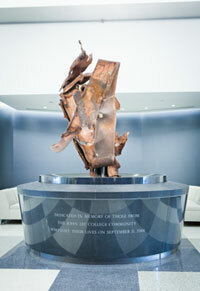 On September 10, John Jay saluted the members of the college community who died in the 2001 terrorist attack on the World Trade Center, with the dedication of a 9/11 Memorial Sculpture. To learn more, visit www.jjay.cuny.edu/911memorial. More than $4.3 Million in Scholarships Received! Students who participated in John Jay’s Pre Law Institute are being accepted at law schools across the country. From Georgetown Law School to Berkeley Law School in California, 25 John Jay’s Pre Law Institute (PLI) graduates have been accepted at 45 law schools. “Many students received several offers and are now exploring their options,” said Vielka V. Holness, Director of PLI. “In fact,” she added, “John Jay’s students have received more than $4.3 million dollars in scholarship awards including many full tuition scholarships to well-regarded law schools in the metropolitan New York City area such as Fordham University School of Law, Benjamin N. Cardozo School of Law and Brooklyn Law School. Students also received offers of admission and large scholarships to top-ranked law schools throughout the country including the University of California at Berkeley – Boalt Hall, the University of Michigan, the University of Minnesota, Emory Law School, the University of Maryland, Northeastern, American, Chicago Kent, and Loyola-Chicago, as well as Pace Law School’s top-three ranked Environmental Law Program and New York’s own public law schools, SUNY Buffalo and CUNY Law. The mission of John Jay’s Pre Law Institute, which was established in 2005 by President Jeremy Travis, is to "identify, motivate and prepare John Jay students and alumni who are interested in preparing for a career in law." The rigorous program, which includes Pre Law Boot Camps, focuses on building the types of skills that support and strengthen students' undergraduate academic achievement and enhance their performance on the Law School Admissions Test (LSAT). “The Pre Law Institute’s initiatives, which involve faculty, help students develop the kind of writing, reading and critical thinking skills that law schools seek,” explained Ms. Holness. “For instance, through the Pre Law Boot Camp, students are exposed to the Socratic method and the other styles of law school learning, including how to build strong legal arguments and identify weaker ones,” added Ms. Holness, an experienced attorney who also directed law school career development centers and served on law school admission committees. John Jay’s pre-law students achieved these admissions through their diligent efforts including their participation in several PLI programs among them the Pre Law Boot Camps, the LSAT Prep Program, and many other of the forty opportunities coordinated by the PLI each academic year. While many students were enjoying seasonal breaks, over 150 of John Jay’s pre-law students participated in the intensive week-long academic-skill building Pre Law Boot Camps. Students worked with Professors John Staines (English), Jacoby Carter (Philosophy), Victoria Bond (English) and Dainius Remeza (English) and instructor Carolyn Nelson (LSAT) in one or more of these four programs to improve their writing and critical thinking skills. The Pre Law Institute looks forward to furthering the academic opportunities available to John Jay pre-law students in collaboration with faculty and other on and off-campus partners during the 2013-2014 academic year. 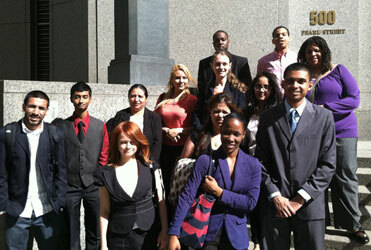 To learn more about the Pre-Law Institute at John Jay, click here. When an alumnus like Richard J. Koehler, (BA ’73) gets involved with his alma mater, he doesn’t do it halfway. A former NYPD executive and a busy labor attorney for the past 30 years, Koehler is a John Jay College Foundation Trustee, chaired the College’s first Founding Generation activities in 2012, and received the Alumni Association’s 2010 Distinguished Alumnus Award. And yet, this fierce advocate for justice wanted to do even more, so earlier this year, he made a generous leadership pledge as part of the $50 million Campaign for the Future of Justice. His gift will support the Student Opportunity Fund, which provides resources to help cover the costs of unpaid internships and study abroad for students and to meet critical needs so the College can provide a cutting-edge 21st Century education to all its students. It will also support the College’s annual Jack Brennan Holiday Party for 600 children in need – a longstanding partnership with the community. In recognition of Richard J. Koehler’s unstinting commitment to John Jay, the College will designate Room L.76 in the New Building as Richard Koehler ‘73 Lecture Hall at a ceremony in late September. Fittingly, this is the first classroom to be named for an alumnus. 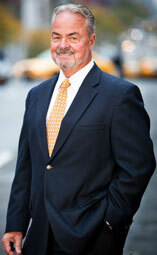 An extended interview with Koehler will be featured in the October, 2013 issue of Justice Matters magazine. Immigration and deportation remain hot-button issues at all levels of government and society, and this fall John Jay College will address the twin topics in a semester-long interdisciplinary series, the Immigration and Deportation Initiative. The initiative gets underway on September 16 with a panel discussion on “Deportation Laws and Their Local Impact,” which will explore the role of immigrant communities in the cultural and economic life of New York City and, more importantly, the impact of deportation on these communities and how that could change in light of immigration legislation now being considered by Congress. The panel will feature New York City Correction Commissioner Dora Schriro; Alina Das of New York University Law School’s Immigrant Rights Clinic; Marianna Yang of Brooklyn Defender Services, and Angela Fernandez of the Northern Manhattan Coalition for Immigrant Rights. The schedule of events includes lectures, discussions, performing and visual art projects, screenings and book talks. “The initiative is intended to bring the continuing legislative efforts around immigration — and the discourse that surrounds them— into the community life and curriculum of the College, to generate debate and conversation, and to engage our students (nearly half of whom are themselves immigrants or the children of immigrants) intellectually with issues that will likely have direct and profound effects on their own lives and those of their loved ones,” reads an introductory statement of purpose for the initiative. Visit the Initiative’s Web site, www.jjay.cuny.edu/ID2013, for a complete schedule of events. The John Jay Center for Career and Professional Development kicks off the fall semester with a new networking event for M.P.A. alumni and graduate students on Thursday, September 26 from 6:00pm to 8:00pm. Guest speaker Marianna Belyavskiy (MPA with Honors 2008) will discuss occupational fraud investigations, healthcare compliance, and internal auditing. Ms. Belyavskiy, a seven-year veteran of the profession, is a Certified Fraud Examiner and is completing her Certified Internal Auditor designation. 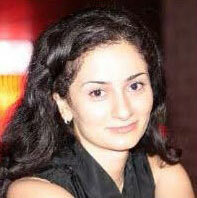 She currently serves as Senior Fraud Auditor at Columbia University and Medical Center. Previously, she was Internal Auditor at New York Presbyterian Hospital, assessing multiple aspects of healthcare including IT, Operations, and Compliance. She started her career at the NYC Department of Investigation, where she served as Confidential Investigator, focusing on fraud and other corruption. She earned her MPA in the Inspector General track, with a concentration in Fiscal Policy Analysis and Oversight, and her BA from Pyatigorsk State Linguistic University in Russia. Don’t miss this excellent networking opportunity! Click here to reserve your spot. Two members of the John Jay community — a recent alumna and a senior faculty member — showed off different kinds of heroics recently in water-related activities. 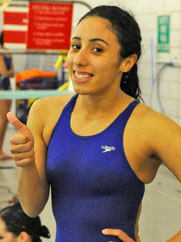 Jezebel Erazo, a four-year student athlete in swimming and cross-country who graduated in May with her degree in Forensic Psychology, was on duty as a Parks Department lifeguard at Brighton Beach when she saw two women carrying an unconscious man out of the water on the afternoon of July 19. As reported in the New York Post the following day, Erazo ran over to the victim of the near-drowning, dropped to her knees and started cardiopulmonary resuscitation. After two or three minutes of CPR, Erazo’s efforts paid off as the victim was revived and rushed to Coney Island Hospital. 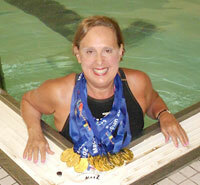 Also in July, Professor Jane Katz of the Department of Health and Physical Education, the former head coach of the John Jay women’s swimming team, traveled to Israel once again to compete in the Maccabiah Games, and once again returned home with a fistful of gold medals. Katz, who has competed at every Maccabiah Games since 1957, won a personal-best 13 medals at the international athletic competition, including 11 individual Masters gold medals, a gold medal as a member of the U.S. women’s freestyle relay team, and a silver in the medley relay. “I’ve got ‘swimlash’ from all the medals around my neck,” said Katz, who also performed a synchronized swimming routine wearing a swimsuit adorned with both the Stars and Stripes and the Star of David. Alumni-Giving Challenge: Raise the Bar! Can John Jay alumni giving reach an all-time high three-month goal of $40,000 between September 15 and December 15, 2013? That's the recent challenge from the volunteer alumni leaders of the John Jay Campaign for the Future of Justice. Never in John Jay history has this amount been raised from alums in a matter of a few months. It's time to raise the bar! The funds raised will help level the playing field for more John Jay students than ever by funding unpaid internships, study-abroad options, mentored undergraduate research, and other important opportunities that many students otherwise cannot afford. Do your part to show what John Jay alums are made of – and, in the process, raise our alumni giving participation! Click HERE to make your gift today! Did you know that the number of alumni who give, no matter the amount, is a key factor in U.S. News and World Report college rankings. Every gift matters .Click here to make yours today! We can’t reach our goal without you.